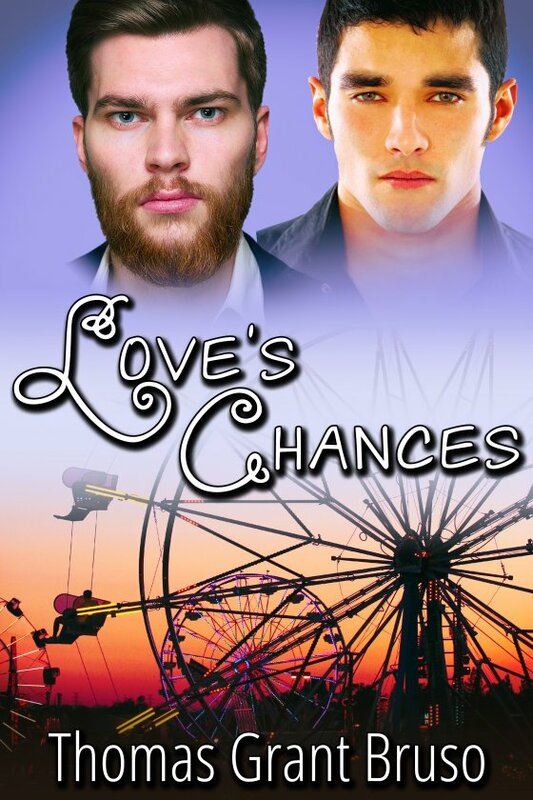 Today’s guest is Thomas Grant Bruso, whose M/M romance Love’s Chances was just released by JMS Books! The idea of online dating can be frightening, not knowing who is talking to you on the other side of the computer screen. Being anonymous and using a pseudonym are the only ways in which to keep a modicum of discretion. T.J. Alton and Devon Ryder soon discover this in their latest search for connection in my newest M/M romance, Love’s Chances. The two thirty-plus-year-old men have been talking to each other for nearly a month, discussing each other’s interests and reservations. T.J. is a recluse and lives with his feline companion, Miss Snickers. He ventures outdoors for work and the occasional errand. Since his parents’ death a year ago, T.J.’s official capacity to socialize with other people has become dangerously limited. Until he meets carpenter Devon Ryder, whom T.J. thinks, after encountering the beautiful blue-eyed workaholic, could help him turn his life around and join the social circle again. Devon is handsome, well built, and a generous person. T.J. learns after spending time with him at a local Great Escape theme park late one night that Devon may be the perfect match for him, the answer to his agoraphobic anxieties. T.J. and Devon’s story is one I’m sure a lot of people can relate to. T.J. Alton is shy and reticent, living alone with a rescue cat after his parents’ death a year earlier. He rarely strays from his usual daily routine of work and home and back again. Then he meets Devon Ryder, an outgoing, colorful, and ruggedly handsome man, with his own long list of emotional baggage. After a month of chatting online, the two men decide to meet in real life, and their first date is at a local Great Escape theme park in upstate New York. As they discover more about each other through conversation and food, a connection is made. But will T.J.’s fears of large crowds and intimacy drive him back to isolation, away from the social circle of life, and the idea of starting a new relationship with someone special? Thomas Grant Bruso graduated from SUNY Plattsburgh in 2004 with a Bachelor’s in theatre performance and English writing. He knew at an early age he wanted to be a writer, and has been a voracious reader of genre fiction since he was a kid. He loves animals, book-reading, writing fiction, and prefers Sudoku to crossword puzzles. He writes book reviews for his hometown newspaper, The Press Republican, and lives in Plattsburgh with his husband, Paul, and their miniature pincher diva, Riley. Find Thomas online at the links below!